DALLAS—Like all returning champions, the DeSoto Eagles now have a target on their back. Everyone wants to be the man that takes down the king. During an explosive second half the Dallas Jesuit College Preparatory Rangers almost made it a reality in the 2017 opener. But, true to form, the DeSoto defensive corps held their own. The Eagles came through with a final score to win over the Rangers, 41-36, at Postell Stadium. There is no doubt who is leading the Eagles offensive squad. Courtney Douglas started the season off on fire against Jesuit College Preparatory with a scoring drive on the first possession. An incomplete pass on the first down led to a 26 yard breakout option by Douglas — much to the crowd’s delight. The dual threat quarterback then drilled a 34 yard pass to J. Brown in the end zone. The following kick was wide but blood was in the water and DeSoto wanted more. Unsurprisingly this was made possible by the high powered Eagles defense. After deferring to the Rangers on the first possession, the stingy secondary forced a punt only after three downs. Studying the game film the Eagles defense doesn’t really do anything fancy. They have a very effective 3-4 formation; which is a testament to their smart and athletic players. In addition to the skill of the defending 6A-Division 2 State Champions, the Rangers’ own errors kept them out of the end zone. The Rangers moved the ball effectively once they found their stride. The combination of Fletcher Rosenbleeth, Matthew Priddy and E. J. Smith accounted for 473 yards. Yet they lost the ball three times due to fumbles and turnovers in the first half. DeSoto opened the second half with a 50 yard punt return by Bryan Hanspard for the score, bringing the Eagle lead up to 28-6. 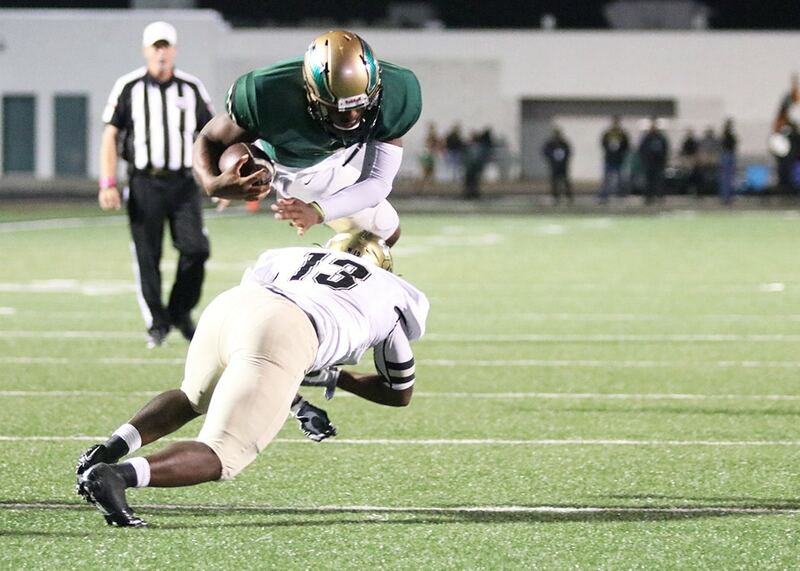 After another score, the Rangers forced a fumble from the Eagles at the DeSoto 36-yard-line. Suddenly the tempo of the game stepped up and things begin to look a bit more interesting. A handoff to Smith who broke tackles gained 10 yards. In an end zone march, he goes the final two yards, bringing the Rangers within one score of the Eagles. And the visitor’s side of Postell Stadium goes quiet. Jamal Brown transformed a four yard pass into a change in momentum, taking a 67 yard jaunt into the end zone to bring the score to 34-20. Sophomore Running Back E.J. Smith, son of NFL Hall of Famer and Former Dallas Cowboy, made his Varsity debut with six receptions, 139 yards and four touchdowns. Smith, tall and massive, looks as if he is already a veteran ball handler. We are expecting great things from him. The Rangers offensive line, while very young, forced a number of holes, which Matthew Priddy and Smith took well advantage of. Tyler Jackson was definitely the DeSoto defensive player of the first half. Statistically, Jesuit made a run of the board in almost every contest — except scoring of course. With 31 first downs, 190 rushing yards, 394 passing yards the Jesuit Rangers simply failed to transform those positions and yardage into points. The last quarter of the game was definitely a nail bitter. In the last eight minutes, the Rangers were desperate to knock off the number two ranked team in the state (8th nationwide). They rallied three drives totaling 160 yards and 9 points. In the final 41 seconds, they were poised at the DeSoto one yard line when Jaylond Dorris intercepted a Ranger pass securing the win for the Eagles. Next week the Eagles continue on the road against Denton Guyer.